A tropical storm photographed from the International Space Station. Photo: NASA. If the Montreal Protocol had been rejected and the risks of ozone depleting substances had been ignored by the world, we would be facing even more intense tropical cyclones in the near future, according to a new study in the American Meteorological Society’s Journal of Climate. Using one of the most advanced atmospheric computer models available, scientists compared our expected future with a scenario in which ozone-depleting substances had never been regulated. When they looked at tropical storms, they found a striking difference: By 2065, the potential intensity of tropical cyclones was nearly three times greater in the scenario of a world without the Montreal Protocol. They found that the driver of that increasing potential intensity was almost exclusively the rise in sea surface temperatures due to the greenhouse gas effect of certain ozone-depleting substances. “The Montreal Protocol has had several unexpected positive effects for the climate. In this study, we show that the Montreal Protocol also mitigates the strength of hurricanes, not because it protects the ozone layer but because it reduces ozone-depleting substances that warm the ocean surface,” said lead author Lorenzo Polvani, a professor in ocean and climate physics at Columbia University’s Lamont-Doherty Earth Observatory and Department of Applied Physics and Applied Mathematics. The “ozone hole” was first documented over Antarctica in the 1980s. Scientists had seen signs of ozone loss and warned that continued weakening of the stratospheric ozone layer would allow more ultraviolet radiation through, increasing skin cancer risk and damage to crops. The response from the international community was swift. Governments negotiated the Montreal Protocol on Substances that Deplete the Ozone Layer in 1987, and the international treaty went into force in 1989. The Protocol phases out the use of ozone-depleting substances, such as chlorofluorocarbons (CFCs) that were once common in refrigerants, foams and aerosol cans. Recovering from the damage created by years of use of those substances will take time, however. Most ozone-depleting substances linger for decades. Estimates by the World Meteorological Organization suggest that, with the work of the Montreal Protocol, the ozone hole will finally begin to heal around 2025. Scientists from several fields have since asked what would have happened if the Montreal Protocol had not been implemented. They have found benefits in areas from heath to agriculture to climate, particularly in its elimination of ozone-depleting substances like CFCs that are also greenhouse gases. A 2013 study co-authored by Polvani demonstrated how the Montreal Protocol has helped to protect Earth’s hydroclimate: The authors found that without it, dry zones would be substantially drier, while wet regions and mid- and high-latitude regions would be considerably wetter by the 2020s. Warm water or cold air? 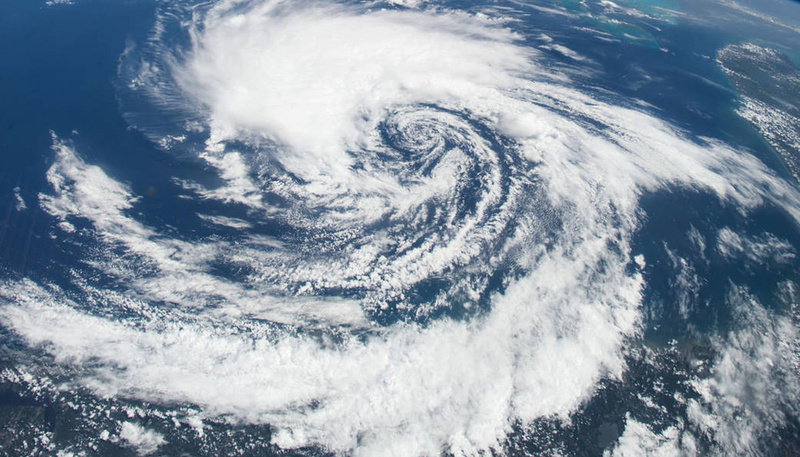 In the new study, Polvani and his co-authors, Suzana Camargo of Lamont and Rolando Garcia of the National Center for Atmospheric Research, turned the question to hurricanes and tropical cyclones. The green line represents historical hurricane potential intensity compared to the 1980-1989 mean. 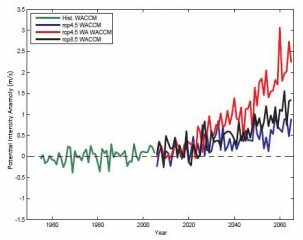 Blue shows forecast potential intensity changes under rcp 4.5, a scenario with relatively ambitious efforts to reduce global greenhouse gas emissions by the late 21st century. Red is rcp 4.5 plus the effects of a world without the Montreal Protocol. It exceeds even rcp 8.5, a high-emissions scenario. From Polvani, 2016. They tested two scenarios: our current trajectory and the scenario of a world in which the Montreal Protocol had never existed. By using a computer model that takes into account land, ocean and sea-ice components and interactive stratospheric chemistry, the scientists could compare the changing forces behind hurricanes over several decades as ozone-depleting substances increased. In comparing the two simulations, Polvani and his colleagues found that almost all of the increase in tropical cyclone potential intensity in the scenario of a world without the Montreal Protocol was caused by the warmer sea surface temperatures that arise from the greenhouse gas effect of ozone-depleting substances. The scientists also looked at the cooling of the tropical lower stratosphere due to the thinning of the ozone layer, which has been suggested as a possible cause for increasingly severe tropical weather over the past few decades. Computer models show that colder temperatures in the troposphere—directly below the stratosphere—can result in considerably stronger tropical cyclones. However, the new study found that the cooler stratosphere created by the loss of ozone had little role in the increase in hurricane strength, even in the computer scenario where the cooling of the stratosphere was 10 times larger than that observed in recent decades. That finding has a bearing on research into the recent increases in tropical cyclone intensity. The study shows that even in a scenario where ozone losses are much larger than those over the past 30 years, the ozone loss did not affect tropical cyclone potential intensity. That suggests that the recent ozone depletion has had a limited role in the increasing intensity of tropical cyclones so far, Polvani said.